Facebook Cell Phone Tracking Ad: Is This For Real? The other day I was watching my wife play some Farmville on Facebook when I noticed this very strange ad in the left sidebar. From what I could tell by looking at it, it appeared to be a GPS cell phone tracking service. The text of the ad read, “Do you think your husband is cheating? Find out instantly where he is right now LIVE.” Doesn’t it seem like this is going to offer someone the ability to track their spouse with some sort of GPS tracking device? Well, I should probably come out with it right away. This is not a genuine GPS tracking service. It is a scam that is only going to end up costing you money in the long run and violating your privacy. This Facebook cell phone tracking ad is designed to get careless people to opt in to receive text messages to their cell phone that will end up costing them money. *Service Explanation: By enrolling in TheMobileSpy.com’s service, you will receive three pieces of content. First, you will receive a report of the three most recent phone numbers to have searched for your location with our service. Second, you will be able to search three phone numbers by area code and prefix (NPA-NXX) to see their registered geographic area. Due to the nature of mobile phones and privacy laws, we will be unable to provide real-time location information. However, you will receive the most up-to-date information regarding NPA-NXX registration. Third, you will be enrolled in a periodical fun facts subscription on your cell phone. You must have cookies enabled for this service to operate properly. Remember, the numbers you search for with our service will be recorded and may be disclosed in someone else’s report! You will get access to three numbers that have searched for your number. I’m not exactly sure what happens if no one has bothered to search for your number yet, but I suspect that nothing happens. You are out of luck. You get a lame “fun facts subscription” that will text “fun facts” to your cell phone for 6 dollars a month. Now that is really lame. If you are still confused about how this service works exactly, let me try and explain it a little better. 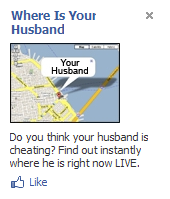 Since this ad was targeted to wives tracking their husbands I am going to use that throughout our example. A wife is on Facebook – since everyone and there mother is on that thing – and she comes across this cell phone tracking ad while commenting on photos of her elementary school friends. She is a little intrigued by the promise find out instantly where her husband is right now LIVE and clicks on the ad. She then goes to the website and fills out her information including her location and her phone number. This information is then stored by the website in some database for them to use later. After she submits her number, she gets information on all the people in the websites database that had searched her number in the past. Since she has a relatively new number nobody shows up. She feels good that she doesn’t have any crazy stalkers out there. She is then prompted by the website to ask about three numbers she is interested in knowing the location of. She obviously enters her husbands number since that is what the ad is promising – being able to track her husband’s cell phone live – and she also enters in two of her best friends’ numbers just for fun. The website then searches its database to see if it has information on any of the numbers that she searched. It doesn’t, but it keeps track of her number and all the numbers that she searched. Sometime later she gets some stupid text from a strange number saying something like, “Penguins are really birds that cannot fly. Isn’t that crazy?! ?” When she gets her cell phone bill at the end of the month she sees this strange charge for $5.95 and wonders where the heck it came from. A word from the wise, do not fall for this Facebook cell phone tracking ad! It does not deliver what it promises and is not a GPS tracking service. Instead, it is a scam designed to cost you $6 a month for the rest of your life you can’t figure out how to cancel this crappy thing. Don’t waste your time, your privacy, or your money on this crap.